Hedera helix 'Duck Foot' has been selected by the American Ivy Society as "Ivy of the Year" for 2004. This miniature ivy has leaves that really do look like a duck's foot! With small leaves not more than an inch across and self-branching habit of growth, it is well suited for pots, baskets and topiaries. Don't let this diminutive ivy fool you; it is also very winter hardy. In test gardens it has survived to at least zone 5 ­ to minus 20 degrees F.
'Duck Foot' has been around since the late 1970's when it was discovered as a sport of Hedera helix 'Merion Beauty'. It has three or five rounded lobes, and is very self-branching. The new growth is shiny, light green, becoming darker with age. The American Ivy Society began its "Ivy of the Year" program in 2001. The first cultivar of Hedera helix in 2001 was 'Lady Frances', in 2002, 'Teardrop'; and in 2003, 'Golden Ingot'. With over 500 different cultivars of Hedera helix there is one suitable for almost any situation. "For successful outdoor planting, keep a few things in mind," says Russell A. Windle, Registrar for the American Ivy Society. 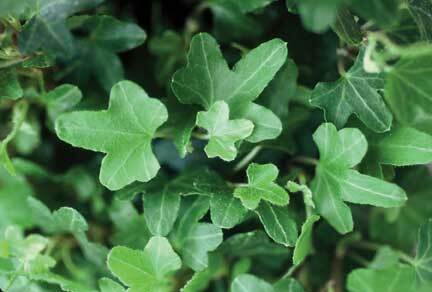 "Green ivies like 'Duck Foot' will tolerate deeper shade, as well as bright conditions. Plant ivies deeper into the ground than they were growing in the pots. Remove the lower two or three leaves and bury the plant to the lowest leaf. This will help the ivy to root along the bare stem. When possible, plant the ivies where they will be protected from the winter sun and wind which causes the most winter damage to ivies."